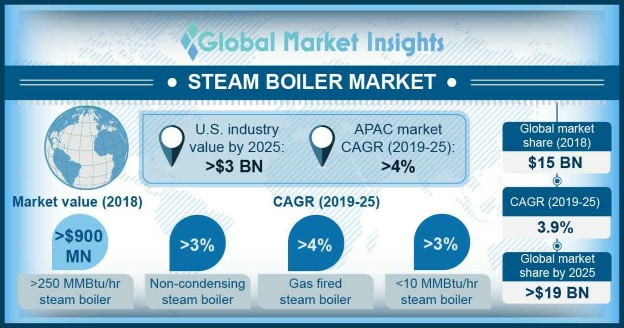 Steam Boiler Market size will surpass USD 19 Billion by 2025, as reported in the latest study by Global Market Insights, Inc.
Increasing investments toward expansion and development of manufacturing facilities along with resurgent economic growth will drive the market size. Respective governments across the globe in conjunction with leading financial institutions, most notably the Asian Development Bank & World Bank are focusing toward expansion of key economic sectors which will further enhance the business growth. Moreover, stringent government regulations will shift the technology landscape toward energy efficient steam boilers which in turn will fuel the product demand. Escalating demand for specialty chemicals, easy availability of feedstock coupled with increasing investment toward capacity additions of chemical production facilities will drive the market size for chemical applications. Ongoing technological advancements along with development of new industrial centers will further stimulate the product adoption. Natural gas fired steam boiler market is set to expand over 4% by 2025. Stringent government mandates toward adoption of low emissions fuels coupled with growing focus to reduce carbon footprint will stimulate industry growth. For instance, the European Union has set a target to reduce GHG emissions by 40% as compared to the 1990 levels by 2030. Furthermore, declining natural gas prices and increasing adoption of sustainable technologies will strengthen the product penetration in coming years. China market size, in 2018 was valued over USD 2 billion. Intensifying government initiatives to increase inhouse manufacturing coupled with shifting focus toward industrial sector development will augment the business growth. Availability of large human capital and raw materials along with robust macroeconomic indicators have further attracted considerable foreign greenfield investments across the range of industries which in turn will complement the global market growth in coming years. Condensing steam boiler market size is set to expand over 5% by 2025. Ability of these systems to offer reduced heating cost and high efficiency will significantly contribute toward industry expansion. Introduction of stringent emission norms on account of rising concerns over environmental pollution will further enhance the industry outlook. ≥250 MMBtu/hr boilers in 2018, accounted for over 6% of steam boiler market revenue share. These systems are predominantly utilized across large scale food processing plants, steel mills, pulp & paper, petrochemical plants and refineries. Ongoing expansion of existing refineries along with escalating demand for primary metal will stimulate the deployment of high capacity units. Increasing disposable income along with the changing food consumption pattern will further complement the industry growth in coming years. Ongoing industrialization along with increasing investment across small and medium scale industries including chemical, food processing, chemical and primary metal manufacturing will drive the Middle East & Africa steam boiler market size. Supportive government policies toward infrastructure development along with large investments from financial institutions including IMF, the World Bank, and the African Development Bank will positively influence the industry landscape. Notable industry participants across steam boiler market include Walchandnagar, SIME, Bosch, Thermax, BHEL, IHI, Siemens, Forbes Marshall, Clayton, Groupe Atlantic, Cochran, Mitsibishi Hitachi Power Systems, CMI, Hurst Boiler & Welding, AC Boiler, Doosan Heavy Industries, Vicotry Energy, Cleaver Brooks, Hoval, Babcock & Wilcox, Fulton, Fondital, Ferroli, and Rentech.